That's what I typed into Google that fateful day when I stumbled upon Wealthy Affiliate. Just a few simple words - How to Make Money Online (Fast and for Free). One click that would change my life. This is my account of how I came to be at Wealthy Affiliate. I hope it will help those who are new to the platform, perhaps still in Starter Membership, and are still wondering if this really is legit or a scam, and if it is possible to make money online by being here. I am not sure how I made my way past all the scams, some that are possibly downright illegal. All the links saying "$250 in 30 minutes"or "$5000 per day". Yes I was naive, and I hoped not to spend a cent to start making money through the web and I wanted that money to start rolling in that afternoon as I sat watching my computer screen. Please don't think badly of me. I have an addiction! No, I am not planning on seeking any therapy, I am not going to join a 12 step program, in fact I hang out with people who feed my addiction and I need to find a way to support my habit. Is it heroin? Some new designer drug? Prescription pills? No, none of those. My two equine pals are eating me out of house and home. Not only that they need their feet trimmed, their teeth checked, a body worker every month, a float to take them places and of course the car to tow it, then there's coaching and clinic fees, membership to various Clubs. The list goes on, but you get where I am coming from - they are expensive! So back to the story. Sitting at my desk, on a quiet Friday afternoon, with a brief lull in the monotonous 9 - 5 grind that is my life, I started Googling. I was excited and to be honest maybe just a bit desperate. I felt sure there would be a way to earn the money I needed, fast and of course free (as explained I didn't have much left after buying horse feed). So with nothing to lose and everything to gain I clicked on a text link in a website and arrived at a shiny sign-in page that said get started for FREE! I now know it was one of Kyle's sites but of course didn't know anything about Kyle, Carson or Wealthy Affiliate at that point. It was a leap of faith, but the sign-in looked professional, and it said No Credit Card required. Phew, that's good cause mine was maxed out as always! I knew enough to know I knew diddly squat about selling products online. Not to worry the very first thing that was suggested was to start the training and build a website. Hmm OK I suppose I do need to learn something about this affiliate marketing, at least how to build the website that would be my goose that lays the golden egg. I was still at work at this stage so pressed the pause button. I thought "I'll really make a start tomorrow when I have some free time and by the end of the weekend the money will start a flowin'." First thing Saturday morning I was at my laptop, hastily set up in my spare room, ready and rearing to make some money. I clicked on the big green GO button, and started the Certification Training. By Lesson 3 my mind was blown! This is actually interesting, my mind was like a sponge, intrigued at what I would learn next, how it would all come together. I knew what a niche was - it was like a small, exclusive group, say those women who carry Louise Vuitton bags, the ladies who lunch! But how does that help me make money online? Once I realised that any group of people were a niche as far as online marketing was concerned I had no problem choosing my niche. Of course it was always going to be horse related, and it very quickly came to me that new horse owners need to buy stuff and I needed to sell stuff - a match made in heaven. Plus the training said I needed to be passionate about my niche. I needed to be enthusiastic enough about the topic to write a lot of blogs, but I didn't need to be an expert. At this point I didn't realise how many blogs I was going to need to write but I had ideas galore. I diligently worked through every single step in every single level, doing each task as directed and by late Saturday night my very own website had come to life before my eyes. To say I was proud of my efforts would be an understatement. I was ecstatic, I was on cloud nine about what I had created. I had so many thoughts about the look and feel of the site, and so many questions about images and products, and content and keywords. I just needed to know as soon as possible, I was hooked. One of the early lessons was to get in and mix with the community. So I filled out my goals and commented on a few other peoples blogs. As I did so I came across quite a few member comments about how this was not a get-rich-quick scheme! They all said that it takes time and effort and they provided links to various blogs with members posting concrete proof. There it was - they were making money, their websites were ranking in #1 place on Google and their traffic numbers were skyrocketing. And in that instant it became real for me. There were people here making the sort of money I wanted to make. They were doing it and I could too and I realised that my mind set had changed. I wanted to be an online entrepreneur, and I didn't want the get-rich-quick scheme anymore. I wanted to build something lasting, something of substance, a new business, and a new career that would be my life from now on. By Sunday night I had completed all 10 lessons in the Level 1 training at Wealthy Affiliate and I was hungry for more. I had built my very first niche website, I had started to delve into search engine optimisation, I had written my very first blog post, I had an understanding of keywords, and I had a handle on how this site was going to make me money. All for free. The platform had done exactly what it promised and I had not spent one cent. BUT I was now at a crossroads. I could stay with my free website and go it alone to search for all the other training I knew I needed to continue my journey and start making money. I felt sure it was all on the internet already - but how would I find it all? How would I know if what I was learning was even correct? Who would I turn to for further explanation if I didn't understand something? Or I could stick with a structure training program that would teach me everything I needed to know in an easy to follow format, one that was giving me results already. I could go out on my own or I could stay with a community of supportive entrepreneurs who I could run my ideas past, who would celebrate my victories and who had the experience and knowledge to answer all my questions. It was a no brainer for me by this stage I was going Premium. I had to set myself up with the very best training I could get my hands on to learn this business inside and out. I wanted to learn from true professionals within my new industry and I wanted the support of a community. I wanted to be surrounded by like minded individuals who appreciated the trials and tribulations of building an online business but who had also been there and done that. I had no desire to reinvent the wheel and I wanted a clear, surefire way of getting to my goals. So can you make money online (fast and for free)? In my opinion honestly? No you can't! Not if you are starting from scratch, and want to build a business that is going to pay beyond your wildest dreams with passive income for years to come. But hey if you want to keep risking your life savings on pyramid schemes, paying $1000's to a guru who will take your money and give you nothing, or filling in surveys at $2 a go, be my guest. Personally I'm happy to put in the work now and pay 98c a day towards my education with world-class training and being able to access the knowledge of online entrepreneurs who are doing it and achieving right now. "What's your future worth - 98c a day?" In the spirit of our community I am of course happy to answer any and all questions about my journey so far as a Premium member or any other burning question you might have for a budding online entrepeneur who's only a little way down the track. You can also check out my 3 Month Progress blog to see what I have achieved so far if you are really keen. Great post - thanks for sharing your journey so far. I share your skepticism at these get rich quick schemes. Don't those scams just sound fantastic LOL. I'd love to make $250 for 30 minutes work. As they say if it sounds too good to be true, it probably is! Yet another gorgeous post, Heidi! I love your writing style, feels like I get to know you a bit better everytime I read one of your posts. Your personality shines through beautifully. Thanks for keeping it real. Oh... and STUNNING Keyword! Well done you. What a lovely thing to say Lauren, thank you so much. There is so much I want to do, starting to think about personal branding after reading about the Top 10 women bloggers and checking out there sites. I'd love to have a site where I just wrote like I can here at WA, but not enough time in the day to start another site just yet. I know, right? I think I write better posts at WA than I do on my sites. I think you're very wise not to start another site just yet - until your other site has really taken off (and you're able to give up your day job). I have 3 sites that are doing okay, instead of one site that's doing brilliantly and it's a MISSION to keep up 3 social media profiles for each. Simply put, I'm not keeping up. 3 sites!! Oh my, yes that does sound like too much work. Great story and one that many of us can relate to..
An excellent post, Heidi, thank you for sharing your insights, it can be so good to reflect on how we arrived, where we are going and hire far we have come. I will be forever grateful to have found WA, I can see it being my full-time future career and I must say I am looking forward to that day very much. Hi Heidi, enjoyable reading. Thanks for sharing. Have great weekend. Thanks Jenny, I did indeed have a great weekend, got to ride my horse both days and almost completed by longest post yet at 4500 words! Just need a few more hours with it and it will be done. WOW that's great Heidi, I struggle to hit 1500 words and that makes me crazy lol. It's nice you get to enjoy what you love (horses, not writing), Riding both days clearly inspired you, and put you in the right frame of mind to write such a lengthy post. Hmmm maybe I should take up horse riding hehe. Have a good week. It's a Best Of post so has to be lengthy to be able to include all the affiliate links I want to include. I have to say these are not my favourite posts to write but a necessity and so I do them. I will be glad when it's finished and published, I'm a little bit over it lol. Wealthy Affiliate is amazing and there is so much to learn here and the community is amazing and so helpful. The only way someone can truly fail here is if they don't put in the effort. We are in full control of our success here and if we put into action what is taught here, success will definitely happen. I'm looking forward to writing that post that say I GOT PAID, like you I truly believe if we put in the effort we can be successful. I'm a patient person and I know our day will come. I think we are indeed kindred spirits Sydney. Had a great weekend with my horse, he actually produced some lovely work on Sunday after a rocky ride Saturday lol. 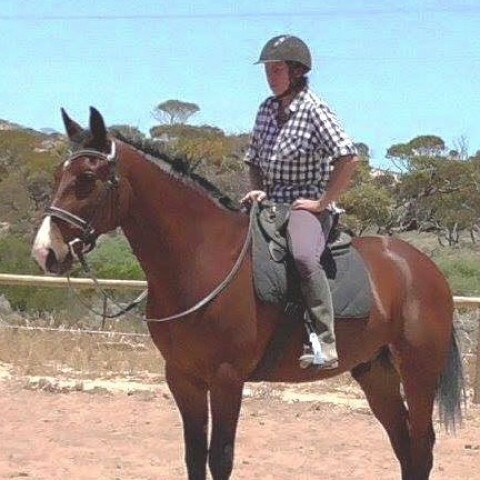 We have our first Working Equitation clinic this coming weekend, which I am really looking forward to giving a go, so that should be a bit of fun. I'm convinced...I'm sure others will be too! Great post. It's funny how some things just seem right once you start. I am notorious for jumping head long into projects and then loosing interest just as quick. This feels right, I think because you don't have to guess at what to do next. You just follow the tried and tested formula and things start to fall into place. You can't lose interest here...just took much to learn...always something new! You are very welcome, it's nice to give back when we can. As I said somewhere else I can't write training yet, just not enough experience at this stage, but I can tell my story and hope it helps someone. Thanks Marla, I'm loving this journey and the support here at WA. This community and the support keeps me ticking along with my site when some days it would be easy to get discouraged and put it to the side. It's truly amazing that you can take any passion and learn to make money from it online with some commitment and effort! Good luck! Yep who would have thought I could actually make money out of horses instead of just spending it! Well I haven't actually made any yet but I am confident my time will come. Best of luck to you on your journey. Truly inspiring, Heidi. Thanks for sharing! Beautifully done Heidi. You've captured every bit of the why and how the Wealthy Affiliate program has stayed injected into our long held expectation of eventual champions. Thanks for assuring me that I am not alone. Happy days!!! Very apt Mike, love it. Great read/info for newbies and a great reminder for all of us and those who may be falling behind - good stuff! You're so right about horses. A good friend of mine had a race horse and said taking care of him was like "throwing money down a garbage disposal"! With my 4, my Aunt & Uncle had the farm for boarding and my Father took care of the bills...........lucky girl you say? You betcha! We affectionately call them “turners” Laurel, they turn good money into manure :) but I wouldn’t be without them. I was at an event recently with my Mum, and she was standing outside the horses yard while I was putting a rug on and she said “gosh this reminds me of old time, except now your paying” and cracked up laughing. It’s good we appreciate our parents, and the sacrifices they made for us. Glad you enjoyed it Dave, I can’t write training or give advice on technical stuff I only have my own experiences at this point, but maybe it will help someone. Great post that defines WA experience. Thank you for taking the time to comment. I’m loving the WA experience, it’s a rollercoaster of a ride that’s for sure. Thank you for your well wishes, I’m so glad you enjoyed it. Makes it all worthwhile when someone enjoys your work. Thanks Happy, I’m enjoying building it out so far, maybe all the money I’ve spent on horses over the years can reap me some back. Thanks for the comment Genelda, is that your real name? It is very beautiful. Well if this website doesn't start making money fast they are gunna go hungry! Well, that's good. Keep the faith. All the best! Very true Heidi. Lots of scams out there - sometimes it’s hard to know which ones are scams, and I think you have to trust your gut feeling on those and walk away - don’t let cruising get the better of you! You’ve come a long way in a short time - I hope you reach the goals you have set for yourself - keep us posted! Thanks Michelle, it's been on fantastic ride so far, I am really enjoying the WA community and building out my site. Hi Heidi - yes I feel your pain, there's only so many hours in the day :D. If we keep plugging away we shall get there, it's only a matter of time! What a great post Heidi. I am glad you did not fall for those make thousands per day scams. They are all scams. There is not even one that is legit. I wish you all the best here at WA and may you achieve great success. Thanks Rika, glad you enjoyed it. I didn't realise it had strung out to so many words so well done if you made it all the way through! That is a real food for thought post Heidi, thank you for the insights. Maybe it will help other Starters feel like they are not alone in the "I want to make money fast and free" camp. We see it all the time - people say they need money fast, or ask when will I make money? how long does it take? But I came here thinking the same thoughts and wanting the quick fix. I was gently advised that this wasn't going to happen and I would need to put in some time and effort. I gotta say it is actually very satisfying to start to think long term and a little more entrepreneurial, knowing you are building YOUR business and YOUR future, and not working for someone else.